Given this new communication way through various social media channels in our lives such as Facebook network helping us find old friends or ex high school colleagues, you never know how you can also find your true love, right? We don’t just get in touch with our friends via online tools, but we can also identify a compatible partner for a romantic relationship. The old-fashioned process of dating has been replaced by a new modern online dating. These niche dating websites for women become more and more popular for people who don’t have too much spare-time or they are too demanding when it comes to finding the right person. However, if you find yourself in a situation when you need and want to find a partner, a dating website may be a good starting step to see matching profiles with your own personality and engage in a conversation with a potential partner. Although, you can find a lot of online resources out there in this area, many of them aren’t free or you don’t know exactly which ones are reputable, so we have decided to make a list with several useful free dating websites for women. Looking to make new connections and share your experiences by joining a community of interesting people in the online area? Check out this website and join it with a simple profile created where you can upload photos, share them with other members and maybe do networking with incredible persons. Who knows how can you find your soul mate? Once you have registered and become a member with full rights, you’ll be able to access other services such as instant message, forum, blog, e-cards and more. Here’s another free online dating website for women where you can try your luck to find your love. It is 100% free, easy and quick to register and find potential partners in accordance to your interests and passions. For further details, you can access a profile-matching to help you find the perfect relationship, a blog to read news, comments and other thoughts or an online chat. Want to be up to date with the latest dating-focused articles? Looking magazine provides you all needed information. As funny as its name may sound, Plenty of fish is one of the leading free online dating websites for single persons with a large database, as well as a relationship-focused dating site that allow people more than a simple registration. The website offers the possibility to search and message for free plus other interesting options for communication to serve the best interest of users. According to Huffingtonpost, the website has operated a few changes regarding, for example, the Intimate Encounters (IE) feature and others. Another free dating website where all single women can find their possible partners a lot easier than they think. Given their internal math-based matching-system, every person’s profile is matched up with her personality to see which partner is the most compatible. With a simple and friendly interface, it requires a basic registration with all your personal information. A place where single women can connect with everyone all over the world. Due to its friendly and interactive platform, with a lot of useful features included such as compatibility quizzes, personality tests, top 10 list plus a chat, games, forum and other interesting news, single women may found what they are really looking for. Probably one of the most known online dating service for women, match.com is a free space where you can meet new people, make new friends and identify a compatible person ready for a serious relationship. Who knows how you’ll find your soul mate and end up with a marriage. Thousands of singles are on match.com, so register for free to start dating today. Whether you are going through a break up or you’ve been single for a long time, here’s a good place to start developing a new relationship. Here’s another matchmaking service for single women who find themselves in a tough period, looking for a compatible partner to share their feelings and moments. Given its simple interface, it is easy to use and the register process only takes a few minutes. Moreover, if you are a lucky person, you can find a match within seconds or, at least, make new friends and discover interesting persons. Another free online service with an easy to use system that allows users to quickly fill out their profile, update photos or chat with others instantly, as well find someone really quickly. If you are open-minded to this form of dating, feel free to join the website by signing in and looking for potential partners. If you are over 40 years old and still single, don’t make a drama out of it and join an online community where you can find persons like you, share various experiences and find your true soul mate. Moreover, the platform is a great resource with useful articles with tips and tricks, single groups, clubs or events plus a valuable advice for both men and women. 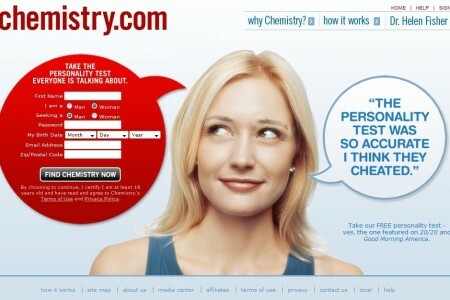 Are you still looking for a chemistry between you and your potential partner? Do you need inspiration? Here’s the last online dating mentioned in this list, a great online resource where you get the chance to make the world famous personality test developed by Dr. Helen Fisher, easy and fun that can offer great insights about your personality and a better way to discover a compatible person. What about you? Have you had an online dating experience recently? If you would like to share your opinions, feel free to leave a comment below.